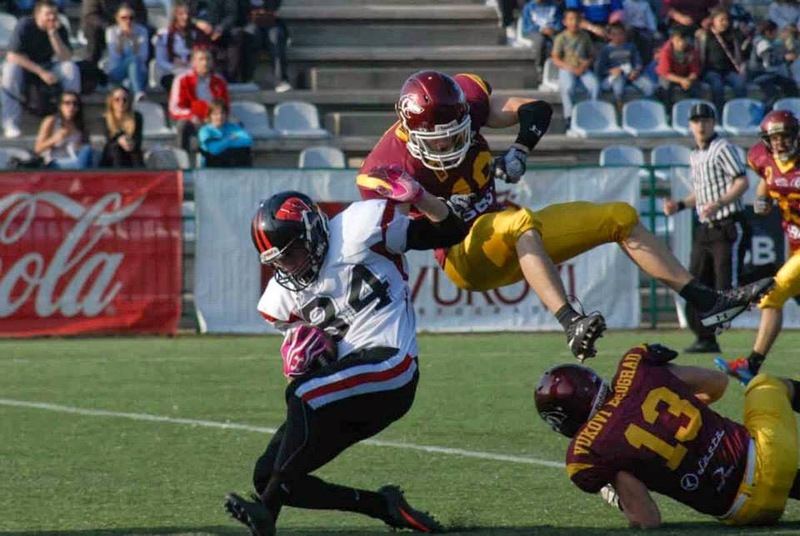 A new season of SportKlub CEFL has started on Saturday 29th March with the reigning champions, Belgrade SBB Vukovi's win over their namesakes from Budapest, the Docler Wolves, with the score of 64:19. SBB Vukovi team, led by coach Kirk Mastromatteo, has had a furious start of the game. Quarterback Shaun Rutherford was brilliant in the opening quarter with two touchdowns of 55 and 38 yards, adding one more passing touchdown and one rushing touchdown before the end of first half. Both teams' running backs also displayed their extraordinary skill having scored two touchdowns each. Serbian national team hope, Mihailo Josović, has rushed to the end zone from 34 and 1 yards and domestic team’s lead was somewhat mitigated by Péter Lennel’s two rushing touchdowns of 12 and 1 yards. Docler Wolves’ hopes of catching up through the air in the second half were put to bed by Dušan Marković who intercepted a pass and brought it home for 80 yards. The next game in CEFL is coming in two weeks and it should be a real treat. SBB Vukovi are hosting last seasons’ vice champions, Kragujevac Wild Boars. Helped by the imports they brought they will try to get their revenge in one of the most important games they will play this season.